My father passed away when I was only 10 years old. He was a patient of diabetes. We are 9 siblings and I was the youngest. We had to struggle a lot to make ends meet because all of them were studying back then. My mother always encouraged us to study. She has been the biggest motivation in my life. After I completed my Matric, I wanted to get an admission in a good college. I gave my entrance exam and got admission only to realize that the fee was too much for me or my family to afford. I never planned on being a burden on my family. I had to drop out eventually because I was unable to pay such a high fee. My life was beginning to get severely affected but I was determined on never giving up. After that, I decided to continue with my studies and got an admission in a government college but you know how government-owned institutions are, they never used to conduct any classes there. Time was slipping away from my hands and I used to feel that I am just wasting my time there. Like I mentioned before, my mother was keen on helping me stay focused and not straying away from the right path. I always had a strong command over English Language and had good computer skills. She, therefore, asked me to teach. Let me tell you something that you won’t believe. I was privileged enough to find a job only at the age of 17. There was a school near my area of residence by the name of Muslim Public High School, and I was appointed as a Computer and English Language teacher there. And yes, I was the youngest teacher over there. Some of my students used to look older than me and some were actually older. I planned to continue my studies on the other hand and used to pay for my classes from my job at the school. To further enhance my skills, I did my diploma in English Language and I have currently joined Aptech Institute at Shahra-e- Faisal Karachi. This is not all that I have to tell you. I want you all to hear about the happiest moment in my life. The time when I heard and got a chance to attend Young Leaders Conference by the School of Leadership. My friend, Asif, had introduced me to this amazing platform where lost souls like me find their true potential. Never had I thought, that a person like me would be able to talk to, let alone face people like I am talking to you if it wasn’t for YLC. I was the quietest among my friends and family members. I was scared of talking to people. I had no confidence to face or talk to others. I used to have a lot of ideas but didn’t have enough confidence or exposure to present them in front of others. Young Leaders Conference gave me both, exposure and confidence. I was shy and nervous around girls too. I had female cousins who I had never spoken to, my entire life because it used to make me nervous and also because I was very narrow-minded. I knew that I had to attend this conference but was heart-broken when I found out that I won’t be able to pay the fee. That was the biggest challenge for me, knowing that I could not afford it financially. The team at SoL gave me an idea about how to raise sponsorships and as they say, where there is a will, one always finds a way, I thought of not giving up. YLC was only 10 days away and I had no money to submit my fee. I knew that I had to attend it at any cost so I started contacting different people. I decided to visit my landlord, who lived approximately 1500 km away from my place with my sponsorship letter. I told him about Young Leaders Conference that was taking place in Islamabad and he asked me about the fee. The fee wasn’t a big deal for him to pay but he refused my offer. This, however, was not the last resort. I had already applied to a lot of companies seeking help for sponsorship. All my dreams were shattered when he said no. I had travelled so far only hoping that he would be able to help me but he clearly refused to help. But I am a strong believer and I believe that if a person is determined and has a passion for something, things eventually fall in place. I went back home only to open my mail and find a letter from a company saying I had gotten full sponsorship excluding the travel for YLC. I remember this day as the happiest day of my life. As far as the travelling cost was concerned, I knew that could be managed. I owned a cell phone and a graphics card for my computer which I decided to sell off, later on, to pay for my travel to Islamabad from Hub. You know what? I had to leave my brother&#39;s reception because it was the same day as YLC. YLC gave me the confidence and exposure I needed to flourish in life. I had no sense of interacting with people and YLC just channelled all that energy into something more prospering. Each day that I wake up, I feel like helping the community in whichever way I can. I believe there is no greater happiness than making others happy. I was always good with computer automation. I knew how to teach this skill to those who don’t have money to afford a computer in this fast pacing world and with technological advancements. I sent out a message to people and went on the streets by interacting with different people, telling them that I would teach them automation. Much to my surprise a lot of people responded and learned a lot from me. Each day I wake up, I am thankful to my mother who had always encouraged me during tough times and trusted me to always do the right thing. I am currently studying at Aptech University and I have to travel 6 hours to and from Hub, where I reside to get there. I never complain because I know someday I will be able to give back to Pakistan what it gave me. I just want to tell people around me, there are a lot of ups and downs in life but if a person is determined towards something, there are no boundaries that could stop him. I urge all of you to stay focused towards your dream and don’t ever let money be a cause of holding you back from what you wish to achieve. 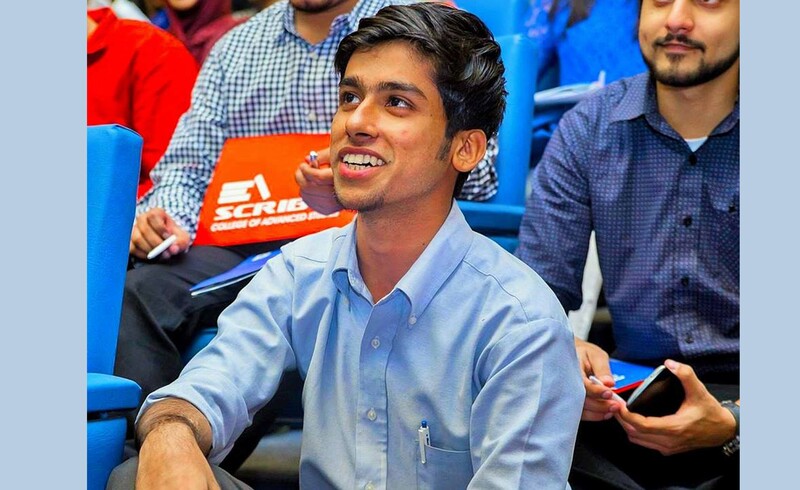 Badar Hasan is 21 years old and is currently in his first semester doing Software engineering from Aptech University, Karachi. He attended the Young Leaders Conference in 2015 and also attended Train the Young Trainer by School of Leadership in 2016.